Product #16066 | SKU SAHDCM | 0.0 (no ratings yet) Thanks for your rating! 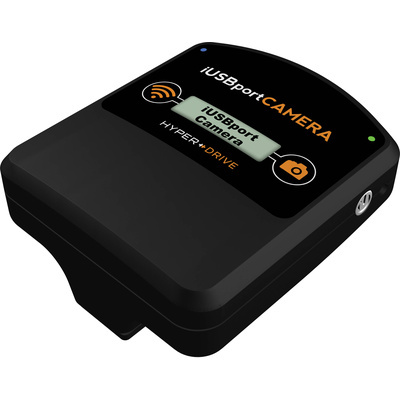 The HyperDrive iUSBportCAMERA Wireless Transmitter permits wireless remote control and monitoring capabilities of your compatible DSLR from a linked mobile device or computer. Using the built-in 802.11b/g/n Wi-Fi capabilities, iOS and Android mobile devices, as well as Mac or Windows computers, can be paired to Canon or Nikon DSLRs in order to gain a real time live view image and remotely control the camera's focus, shutter release, and other settings. With touchscreen smartphones and tablets, touch-to-focus control permits exacting placement of focus anywhere within the scene and manual focus with zoom and focus stacking functions are also available. The transmitter is designed to fit within the accessory shoe of a DSLR and also incorporates a 1/4"-20 tripod mount for additional attachment options. One USB port is available to enable wireless streaming of movies, photos, music, and documents from a connected hard drive or portable storage device to mobile devices, and 4GB of built-in memory is available for storage. A backlit LCD screen displays the devices mode and an integrated 3300mAh battery alleviates the need for an external power source, while also doubling as a backup power solution for connected mobile devices. Full-resolution photos are instantly, and wirelessly, delivered to linked devices up to 300' away. Up to 8 distinct devices can be paired at a time, permitting clients, assistants, directors, and other users the ability to view imagery remotely as it is being recorded. Linked devices can wirelessly control all camera settings, including ISO, aperture, shutter speed, white balance, and more. Remotely trigger the camera's shutter release as well as start and stop video recording. The remote live view image and shutter release capability permit you to shoot from a distance, benefitting working in cramped situations or with difficult-to-photograph subjects. When working with a touchscreen device, tapping anywhere on the screen when in live view permits exacting focus control. Additionally, manual focus with zoom and focus stacking controls are also available. Configure HDR bracketing controls, bulb shooting, self-timer duration, and time-lapse sequences. Contents of the camera's memory card can be viewed and modified remotely from a linked device. A USB 2.0 port enables the transmitter to be attached to external hard drives for wireless media streaming to mobile devices. Up to three devices can be streamed to at a time for viewing movies, music, photos, or documents that are saved to an external hard drive. This feature will not stream video from a connected digital camera. 4GB of internal memory are available for for content streaming and wireless saving. Two-way file transferring is possible with up to 8 different Wi-Fi devices. 802.11b/g/n Wi-Fi connectivity permits fast transfer speeds. The built-in rechargeable 3300mAh battery alleviates the need for an external power source and can also be used as backup power for mobile devices. Designed to attach to a camera's accessory shoe for easy connection to the camera using the included USB cable. A standard 1/4"-20 tripod mount is incorporated into the device's design for additional mounting options. A backlit LCD screen displays configuration modes and other device settings. EOS Rebel SL1/100D, EOS Rebel XSi/450D, EOS Rebel T1i/500D, EOS Rebel T2i/550D, EOS Rebel T3i/600D, EOS Rebel T4i/650D, EOS Rebel T5i/700D, EOS 40D, EOS 50D, EOS 60D, EOS 70D, EOS 7D, EOS 6D, EOS 5D Mark II, EOS 5D Mark III, EOS-1D Mark III, EOS-1Ds Mark III, EOS-1D Mark IV, EOS-1D X, and EOS-1D C.
D5000, D5100, D5200, D5300, D90, D7000, D7100, D300, D300S, D700, D600, D610, D800, D800E, D3, D3S, D3X, D4, D4S, and Df. iPad, iPhone, Android, Mac, Windows, or any device with Chrome or Safari web browser.